A short composition that provides practice material for a particular musical skill is called an étude. 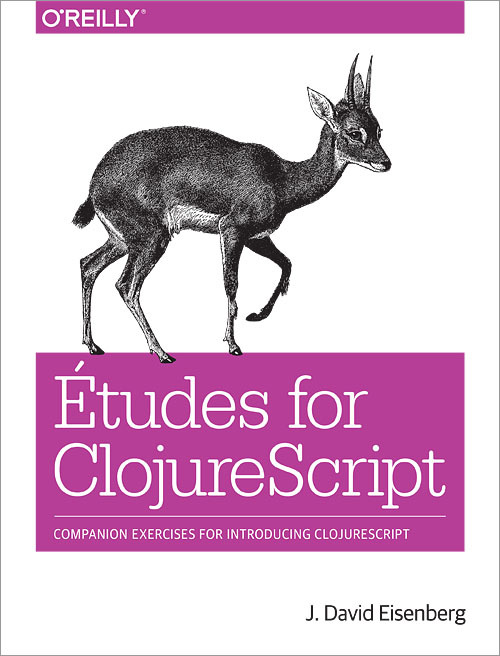 In this hands-on book, you’ll find more than 30 études to help you practice ClojureScript skills for specific programming areas, ranging from functions and variables to asynchronous processing. Each of these small projects includes a description of a program that you will compose (write) in ClojureScript. Though not as difficult as their musical counterparts, these programming études will help you stretch beyond the material and examples that you find in most ClojureScript books or online references. One chapter features études for an open-ended project that will help you put together what you’ve learned. Solutions to each étude are revealed in the appendix.